Domaine la Consonniere was created in 2009. The vines were previously used to produce Domaine de la Cabane. The roots of Domaine la Consonniere actually date back to 1890, when his great great, grandfather began purchasing vines in the Southern Rhone Valley. Today, Domaine la Consonniere is owned and managed by Sebastien Cuscusa. One of the first moves that Sebastien Cuscusa made was to bring in Philippe Cambie as the consultant for the wine making and the vineyard management. Domaine la Consonniere owns 5 hectares of vines in the Chateauneuf du Pape appellation. The vines are spread in different parts of Chateauneuf du Pape. They are planted in the lieux dits at Pignan, Font du Loup and Les Saintes Vierges. Most of their terroir has sandy soils. The vineyards owned by Domaine la Consonniere are situated in three lieux-dits; Les Saintes Vierges, Pignan and Font du Loup. 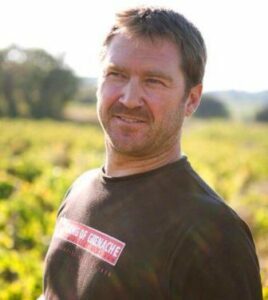 Sebastien Cuscusa is hoping to purchase more vines to help grow Domaine la Consonniere. The debut vintage of Domaine la Consonniere was produced at Vignobles Brotte. The vines are planted to mostly Grenache. A lot of their Grenache is more than 100 years of age. They also have plantings of Mourvedre and Clairette Rose’. Domaine la Consonniere produces 1 red Chateauneuf du Pape wine. Domaine la Consonniere Chateauneuf du Pape is made from almost 100% old vine Grenache. The vines are more than 100 years of age. The terroir is sandy soils from vines planted in Les Bedines, Les Font du Loup, la and Pigna and Les Saintes Vierges. While mostly Grenache, the wine is blended with Mourvedre and a small portion of Clairette Rose. The wine is aged in a combination of traditional, rectangular shaped, cement vats and demi muids for 22 months before bottling. On average, close to 1,700 cases are produced in each vintage of Domaine la Consonniere Chateauneuf du Pape. Domaine la Consonniere can be enjoyed on the young side. Young vintages can be popped and poured, or decanted for about 1 hour. This allows the wine to soften and open its perfume. Older vintages might need very little decanting, just enough to remove the sediment. Domaine la Consonniere is usually better with 3-4 years of bottle age. Of course that can vary slightly, depending on the vintage. In the best vintages the wine should be consumed within 3-8 years after the vintage. Domaine la Consonniere is best served at 15.5 degrees Celsius, 60 degrees Fahrenheit. The cool, almost cellar temperature gives the wine more freshness and lift. Domaine la Consonniere is best served with all types of classic meat dishes, veal, pork, beef, lamb, duck, game, roast chicken, roasted, braised, stewed dishes, sausage, barbecue and cassoulet. Domaine la Consonniere is also good with Asian dishes, hearty fish courses like tuna, mushrooms pasta, eggplant, tomatoes and cheese. Light, easy drinking, bright, fresh, red fruits for uncomplicated early drinking. Fresh, sweet and lively, the wine retains its core of sweet red fruit all the way through. Produced from a blend of 90% Grenache and 10% Mourvedre the wine reached 15% alcohol. Fennel and garrigue bring you to a medium bodied, light, open styled cherry filled wine that needs to be consumed young. Focused on red berries, this light, elegant style of Chateauneuf is ready to drink.